Getting outdoors and enjoying the wilderness is something everyone should do. It’s not always easy to find the time to go camping. Sometimes, the urban lifestyle clamps down on us, and we get lost in our workload and family life. When the weather is right, it’s always a good idea to pack up some gear and go on a hike or camp. Camping has it’s own nuances. The idea is to get back to basics, be symbiotic with nature, and feel that wonderful connection to the planet and your environment. It can be truly special to sit in the silence of the great outdoors, enjoying oneself, and contemplating your thoughts. It’s a somber and peaceful feeling. Even going for a vigorous hike to a remote local can be a superb relief from the concrete jungle. It can take some time to acclimatize to the whole experience. Some folks find camping to be an unpleasant experience. 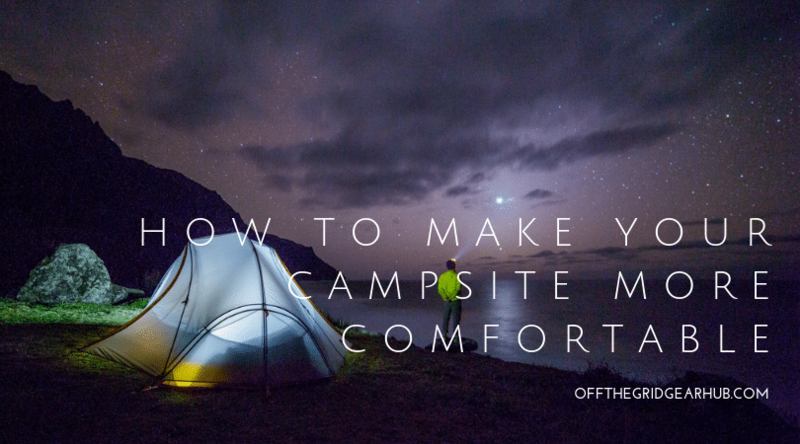 The lack of electricity, the inability to digitally detox or separate themselves from the online world, etc… But to cut the buck and to be honest, camping can be uncomfortable. In some ways, it’s supposed to be. In a lot of ways it’s about getting to the core of yourself and relying on a skill-set that you may not use in everyday life. Some people are a little bit more sensitive to others, and need some comforts of home life to be content. The weather doesn’t always agree, and there can be bugs and pests. Your meals may be even a little lacking compared to what you are used to. Bug repellent: Be sure to bring some bug repellent or bug spray with you. There are many types on the market. There are torches, candles, spray, and even netting that you can use to keep the little nasties at bay. Plan Ahead: Planning goes a long way for camping. Do your research on the weather and area first. Know where the nearest stores are, such as gas stations or retail stores. You may need something that you forgot to pack. Useful Supplies: It’s always a good idea to bring some extra rope, a tarp, and some carbiners with you. A tarp has a lot of uses; if it’s raining, you can put it on top of your tent. Or, if the ground is wet, you can put it under your tent. Don’t forget to bring a backup lamp or a flashlight. You don’t want to be caught in the dark. There are many tents on the market now. Some are water resistant, and some are easier to setup. Some are large with multiple rooms. Choose the one that’s right for you. One important specification of tents is the peak height or maximum ceiling height. It can be annoying and maybe even a bit painful to crouch or bend-over in a small tent. So choose one you and your party can fit comfortably in. Once your campsite is setup, you’ll have some down time. Be sure to bring some games, cards, books, or even some sporting equipment to pass the time. Camping is about roughing it in a lot of ways, so do yourself a favor and keep the tablets and devices at home. A good sleep is a luxury when camping. Sometimes, the weather or animals are loud, or the ground uncomfortable. It’s important to get as best a sleep as you can while out in the wilds. An inflatable mattress is a good choice. They sure beat out the simple foam cell pad ones. It’s important to strike a good balance for yourself or your group. Pack what you need to make it a special trip, but don’t bring the whole house.